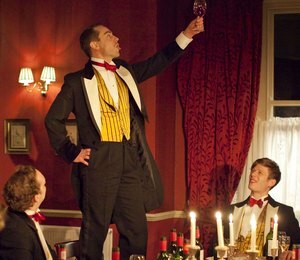 Laura Wade with spectacular timing (a general election due in two weeks time) has written a play about a group of very privileged Oxford undergraduates who form a political dining club called The Riot Club. Founded by an 18th century hell raiser Lord Ryot, this club is one with a membership of landowners and top Tories who trash venues and escape penalties by handing over a large cheque to more than pay for the damages. It is based on the Bullingdon Club at Oxford which boasts past members like David Cameron, the present leader of the Conservative Party and would be Prime Minister, Boris Johnson, Mayor of London, and Charles Spencer now Lord Spencer, younger brother of Princess Diana (bizarrely confused on Wikipedia with Charlie Spencer our own less aristocratically connected theatre critic). Membership of the fictional Riot Club is by invitation only, initiation consists of one's own college room being trashed and the side benefits are lifelong "old school tie" type introductions and favours from influential past members. The play opens with a past member Jeremy (Simon Shepherd) discussing the club's current and past shenanigans with his godson, the diminutive Guy Bellingfield (Joshua McGuire). Guy is one of three touting for next year's presidency of the club along with smooth operator and Greek millionaire's son Dimitri Mitropoulos (Henry Lloyd-Hughes) and Harry Villiers (Harry Hadden-Paton). The present incumbent of the post James Leighton-Masters (Tom Mison) has not had a legendary reign and at the dinner, his application to a merchant bank for a job is read out and derided as his having no faith in the Riot Club's power of job placement through connections. Set in a gastro-pub in Oxfordshire, the Riot Club booked under a false name, have an evening of hi-jinks and more planned. In fact the evening ends in a minor sexual assault of the innkeeper's daughter Rachel (Fiona Button) and violence towards her father Chris (Daniel Ryan). There are complaints when the ten bird roast, a tiny bird encased by nine increasingly larger birds is found lacking and disappointment when the prostitute (Charlotte Lucas) hired by Harry as entertainment turns down the opportunity to make £300 by pleasuring all. Even the trip to Iceland in Daddy's private jet at the end of the meal would appear to be scuppered by the real life volcanic ash downing of flights across Europe! While an easy target, these upper class men are not totally realistically drawn with Alistair Ryles' (Leo Bill) speech about class envy nor are they as witty as the real thing. There is no way that we can believe that these are the best and the brightest or that public school classically educated men would confuse the words peasant and pedant. It is also not believable that this criminal incident could be covered up with a witness to the attack on the innkeeper. The main point of realism for me in Posh is in the trashing of the room and drunken behaviour which could be taken from a nasty documentary. I am also inclined to believe in the pact to let one man take all the blame for the physical assault but whatever the pressures of the group on behaviour, it is hard to believe that no individual has the courage to stand up for decency. There is some barbershop type singing, a rap song and a poem delivered by Hugo (David Dawson) and much rowdiness in between but the play feels overly long with at least two too many musical interludes. Black dustbin liners have been thoughtfully provided to each diner by the club should they feel the need to throw up. In order not to block the audience view while the diners are seated round a long oval table there are some curious directorial moves with the centre front diner travelling over to stand at the rear or crouching down next to his chair. There are good performances from the cast of young men assembled, some of whom are newcomers to the London stage and who will be theatre stars of the future. Leo Bill is already well established and his lizard like, unpleasant Alistair Ryle seems increasingly desperate as the group turn on him. The design of the gentlemen's club where Jeremy hangs out is seriously panelled and the pub has some poorly coloured paintings and stag heads on the wall which will meet an inevitable end. I liked the portrait of the 18th century Riot club members fading into the real club members of today. As a close up examination of power and privilege Posh is guilty of cynical caricature. Posh has been feted as the Royal Court follow up to the big hits Jerusalem and Enron but I think this is unlikely. With: Joshua McGuire, Richard Goulding, Jolyon Coy, Kit Harington, Harry Hadden-Paton, James Norton, Henry Lloyd-Hughes, Tom Mison, Fiona Button, Charlotte Lucas. ©Copyright 2010, 2012 Elyse Sommer.